Subway, Great Yarmouth, the leading sandwich provider in the UK & Ireland serves a great selection of tasty Sub sandwiches at it's Gorleston-on-Sea outlet near Great Yarmouth to eat in or take away. From Great Yarmouth follow signs for Gorleston-on-Sea. 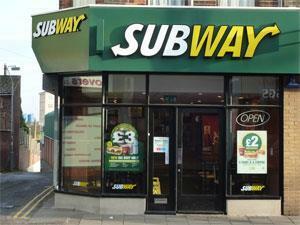 Subway is located towards the end of the main High Street, just prior to the traffic lights/crossroads.